Like what you see so far? 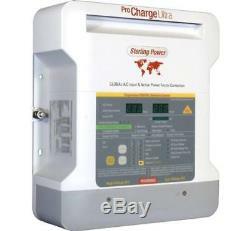 Sterling Power Digital Battery Charger - PCU1240. Ask a question about this item. Maintaining extremely high quality products. Number of Outputs - 3. Weight (kg) - 2.0. Boats, RV, Leisure and more. This charger's design is the charger of choice by the world's largest production boat builders. It is fitted to more new boats than any other charger in the world. Suitable for marine and mobile applications, capable of running on voltages between 90v and 270v and frequency of 40-70hz. Has 3 isolated outputs to enable separate battery banks to be charged (or can be coupled together for a single output). 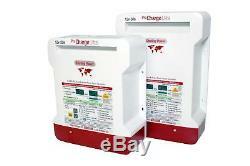 Features a fully automated and electronically programmed charging process, Also operates as a DC power supply. One of the world's most efficient chargers - This is courtesy of active power factor correction. The Pro Charge Ultra is rated at over 90% efficient. PFC is an extremely important feature. Non-active PFC chargers are approximately 65% efficient. Truly Global Application and perfect for generators - The Pro Charge Ultra shall work at AC voltages (80-270VAC and 40- 70Hz) and DC voltages (130-320V). UL 1236 SB listed - the highest build standard. Comprehensive 32 LED front panel - The user is provided with a voltmeter, ammeter and output power display. The panel also includes charging profile statuses and warning statuses. Multi Lingual - The Pro Charge Ultra now comes with front labels, Remote control and instructions in different languages: English, French, German and Spanish. 11 pre-programmed charging profiles - for AGM, Gel, sealed/flooded and calcium batteries. We also include a customizable option to allow the user to programme their own profile via the front panel. Larger voltage / current requirements? The Pro Charge Ultra series can be put in series or parallel with other Pro Charge Ultras. This is enabled by the chargers have dynamic charging ability. Power Pack / Power Supply - This charger works effortlessly as a power supply to DC loads to prevent depletion of your battery capacity. Battery Temperature compensation - sensor included. Automatic Desulphation mode - 7-10 days cycle with anti-stratification program to keep batteries rejuvenated. Perfect for generator use - Due to its active PFC tolerance of AC input it shall run from crude sine wave forms - typical from generators. Also, % Power Reduction you can set the charger to run at lower power outputs to complement a wider range of generators and low shore power connections. Remote control - with 10m cable available, must be orderd separately (PCUR). We are main distributors of all Sterling Power products. We will only deliver to addresses within the United Kingdom unless the advert suggests otherwise. We will inform you if we become aware of an unexpected delay. Please note that if your order is made up of a combination of items, deliveries may, on occasion be made separately. Unfortunately this means we are unable to deliver to the following areas: AB31 - AB38, AB40 - AB56, KW1 - KW17, PA20 - PA78, PH4 - PH50, IV, HS, JE, IM, BT, Channel Islands & Ireland. Opening hours We are open Monday to Friday from 8am until 5.30pm and 8.30am until 4.00pm on Saturday's. Option 1 -Having the battery tested yourself Take the battery to a local garage for a battery test. Make sure the battery is fully charged and over 12volts when the test is performed. Ensure that the voltage is shown on the test report. When we have received the test report and the invoice we will call you to arrange a new product to be sent to you and collection of the faulty item. The battery will be sent back fully charged and ready to use. We deal with many customers and it is not possible to remember every individual case. If you are sending unwanted goods back they must be in a resalable condition otherwise they will not be accepted as unused. When you try to install the item you forfeit your right to cancel. We do our best to make sure that we have everything in stock that we list on the internet but occasionally we get caught out when stock drops to low levels. For certain deliveries we also use a pallet company or our own transport. It is crucial that you spell your address correctly and include your postcode accurately because our system takes your text directly and imports it into our dispatch system. Errors can cause delays or even the need to rebook a parcel at your expense if your data entry is the cause of the problem. Waste Battery Regulations Under the Waste Battery Regulations, Battery Megastore are now offering a take back scheme for all portable waste batteries, you can return your waste batteries to our business premises in person. End-users may find stores in their local area more accessible. WEEE With effect from July 2007, the UK's Waste Electrical and Electronic Equipment (WEEE) Regulations require that all producers of electrical equipment are now obliged to pay for these items to be recycled when they become waste. We are one of the UK's fastest growing stored energy suppliers and we are committed to providing comprehensive information and a top quality product range at a highly competitive price point. We pride ourselves in supplying our quality products across a whole range of clients and applications. We work hard to supply an efficient service to all of our customers, from large industrial organisations and battery wholesalers, UPS battery banks for financial institutions through to individual consumers purchasing single car batteries. Battery Megastore Ltd has experienced strong growth since its beginnings in 2000. Try us, you won't be disappointed. Yours sincerely Battery Megastore Team. Want the latest offers first? Sign up to our free newsletter. 99% of customers would recommend us to a friend. The item "Sterling PCU1240 Marine Battery Charger Power Pro Charge Ultra 12V 40A MS2" is in sale since Wednesday, October 12, 2016. This item is in the category "Vehicle Parts & Accessories\Garage Equipment & Tools\Battery Testers & Chargers\Chargers & Jump Starters". The seller is "batterymegauk" and is located in GL20 8NB. This item can be shipped to European Union member countries.